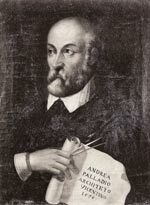 Andrea Palladio is undoubtedly the most famous architect of the Western world. Born of humble origins in the distinguished city of Padua in northern Italy on November 30, 1508, he was named Andrea della Gondola  Andrea  in honor the feast day of St. Andrew. As a youth he was apprenticed as a stonemason, receiving his early training in the Pedemuro workshop. His lively personality and abilities in science and mathematics came to the attention of his first mentor, Count Gian Giorgio Trissino (1478-1550), a Vicentine humanist and diplomat, whom he first met around 1537. Trissino took the young Andrea into his Academy devoted to providing local noblemen with a classical education where Andrea was instilled in humanist values, including Study, the Arts and Virtue. It was Trissino who gave him the name Palladio and introduced him to the precepts of the Roman architect, Vitruvius. Succeeding influential patrons and mentors  Alvise Cornaro (c.1484-1566), Daniele Barbaro (1514-1570) and his brother, Marc’Antonio (1518-1570)  provided Palladio with commissions and access to prominent families in the Veneto and in Venice whom Palladio astutely cultivated with his engaging personality and keen business sense. During his lifetime, Palladio was able to populate the fertile countryside of the Veneto region and its towns with his palaces and country villas built for Vicentine noblemen and in Venice, a series of remarkable churches, notably San Giorgio Maggiore and the Redentore  placed in stunning settings, many of which today exist in excellent condition and are easily accessible. The range and quality of Palladio’s architecture is truly exceptional. His legacy and the enduring beauty of his buildings can be attributed to his design aesthetic and principles  set forth in his Quattro libri  which stem directly from all’antica (in the antique manner) in which he excelled. He used his studies of Roman architecture over the course of several visits to Rome during the years 15411554 with Trissino and his familiarity with ancient and Renaissance theory and practice to develop his own distinct design language refined over many years. In the words of Robert Tavernor: Palladio’s “ designs, while pursuing the rigours of the classical language  of propriety, order, and proportion  are infused with an infectious humanity, a love of virtue and good action, which shines through his buildings even today: their scale, form, details and materials harmonize with the rural landscape and contribute to the quality of civic life in a way that has proved to be inspirational for the followers of the theories he espoused”  and to those of us who embrace the human spirit.